“Exasperated parents often tell me they have a willful child who insist on getting their way, who takes toys from siblings, or who can’t wait for anything because they need it now! The parents are conflicted. They want to set limits they can stick to, but they don’t want to be overly strict or risk triggering another eruption from their young volcano. Setting limits is one of a parent’s most important jobs—and it’s also one of the most difficult. When we set limits we provide children the guidelines necessary for moral and social development. Your ultimate goal is to help your children be able to monitor their own behavior and make good judgments, even when you’re not around. Here are a few time-tested guidelines for setting limits that will reduce confusion and teach your children the desired lessons. Kneel down so you’re on your child’s level and don’t appear like a giant in their small world. Look them in the eye and calmly ask why they grabbed the toy or pushed their brother/sister. Children who feel they’ve been heard often listen better when you explain why their actions aren’t acceptable, and they need to understand this in order to change their behavior. Parents get frustrated when they have to keep repeating the same rules over and over again like a broken record. But some children really do need to hear a rule many times before it sinks in. Try to have patience, and don’t give up. Eventually the repetition will pay off and you’ll hear them say, “May I share that with you, please?” without being reminded. Consistency is vital when setting limits. Unfortunately, reality is a series of unexpected events, which can make it a struggle to stay on track. If Andy is usually given a time-out when he hits his sister, try to enforce the rule every time, even if you have relatives over for dinner, or you have the flu, or you just don’t want to deal with it. Inconsistency confuses children. When you give mixed messages, the child’s inner response is: “Mom didn’t say anything, so it was okay to hit this time.” They may continue the behavior because they aren’t sure what your response will be. Remember, children are pros at testing limits. We all lose our tempers occasionally, but a limit that’s overly punishing can cause resentment and may lead to continued misbehavior. Taking away your child’s TV privileges for a month, having them wash every window in the house after drawing on one, or grounding them for a semester misses a teaching opportunity. Punishment should fit the crime and teach good behavior, not generate continued resentment. If the child doesn’t learn from the limit imposed, they’ll spend their time plotting other ways to work around the system. Make sure you can follow through on the limits you set. Let’s say you tell your twelve-year-old if they swear, they won’t be allowed to see their friends for a month. You’ve painted yourself into a corner because you can’t physically stop them from seeing their friends, who probably live in the neighborhood and go to the same school. As a result, the imposed limit has no effect. An alternative limit might be taking away ipod privileges for the evening. Take a moment to think before setting a limit so you’re sure it’s enforceable. When children learn to read, limits aren’t usually tested because they easily become bored with what they’re being taught. With our online reading program and game, the only limits you’ll have to set are how long they can use the program because they’ll want to continue learning! Your children will love to learn with Lingo in Reading Kingdom’s magical land of literacy. 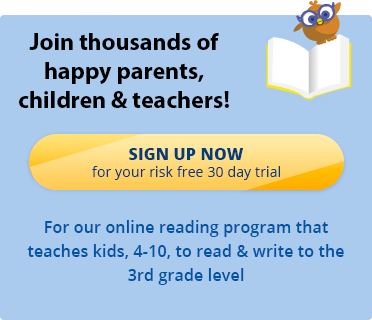 Read testimonials from hundreds of happy teachers and parents that have already taught children how to read up to a third grade level, then click here to sign up for a free 30 day trial of our interactive reading software.